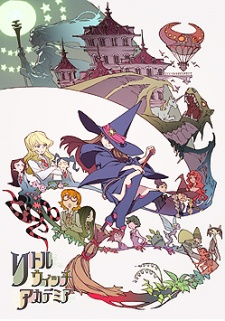 Watch Little Witch Academia full episode online English Sub. Synopsis: For young witches everywhere, the world-renowned witch Shiny Chariot reigns as the most revered and celebrated role model. But as the girls age, so do their opinions of her—now just the mention of Chariot would get a witch labeled a child. However, undeterred in her blind admiration for Chariot, ordinary girl Atsuko Kagari enrolls into Luna Nova Magical Academy, hoping to someday become just as mesmerizing as her idol. However, the witch academy isn’t all the fun and games Atsuko thought it would be: boring lectures, strict teachers, and students who mock Chariot plague the campus. Coupled with her own ineptness in magic, she’s seen as little more than a rebel student. But when a chance finally presents itself to prove herself to her peers and teachers, she takes it, and now it’s up to her to stop a rampaging dragon before it flattens the entire academy.